The first video clip features some pretty amazing Etch A Sketch artwork, which leaves my own efforts looking even more rubbish than they already were! 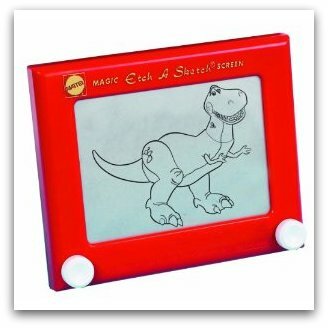 Originally available in the 1960's, the original Etch A Sketch drawing toy is now considered a classic. In fact, it's so popular that it's available to buy once again. Etch A Sketch appeared in both Toy Story films and the film Elf. When I was a child this toy kept me amused for ages. Needing no batteries, pens or pencils, you would simply turn the knobs to draw horizontal, vertical or diagonal lines. Of course, in the 70s and 80s it seemed like magic to many kids, but what actually happens is that by turning the knobs you move a stylus that displaces aluminium powder on the back of the screen, leaving a solid line - just don't tell your kids! When you got fed-up with your picture you would simply shake to erase and start all over again. Or if you had an annoying brother, he would shake it for you - before you had finished your work of art! Want to know how it erased the picture? Well, when you turn it upside down and shake it, polystyrene beads smooth out and re-coat the surface with aluminium powder. With no messy ink or paints, this toy was ideal for parents trying to keep their kids amused on a wet afternoon.